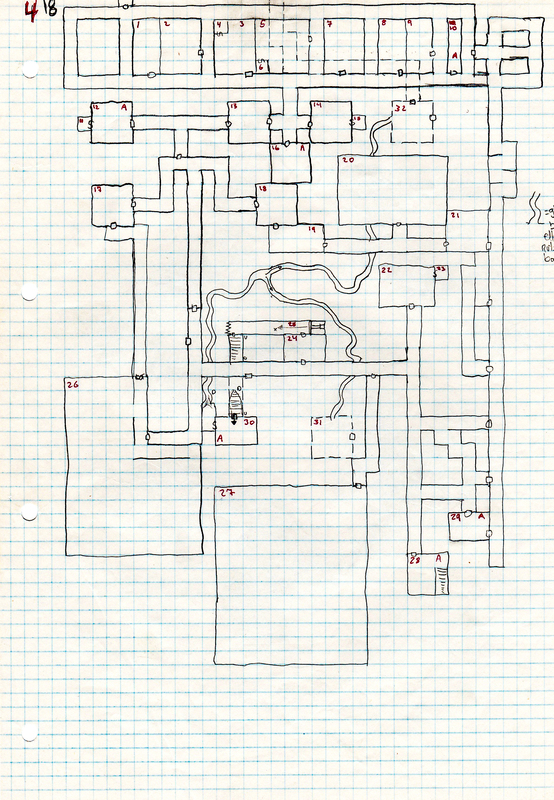 Next up in my old GM papers are the 2nd level of my very first dungeon. We’ve just gone through the first level and it’s 56 room descriptions in the previous 4 GM Nostalgia posts. If you’re new to the series you can catch up on this link, i took the liberty of sorting it chronologically for you, Category: GM Nostalgia. So while looking at the first map and the second map, it appears to me that the first level is some sort of huge building, set before a mountain of sorts, as a form of gateway or defense network for the entrance to this 2nd map. Ironic that by setting this huge defense, you would actually make would be heroes stronger as they advance through it, i wonder why no villain ever thinks about that. So here is the 2nd level of my very first home made dungeon.